Once you send your product feeds and choose to create FBA shipments in a Private Workflow, you will be on the Proposed FBA Shipments page. On this page, you will have the choice to create or decline a shipment, or add to an existing working shipment if applicable. 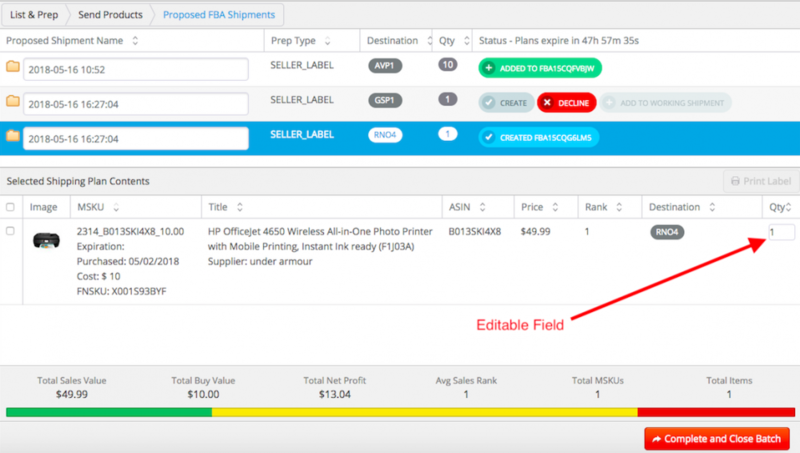 For any shipment created or where the Add to Working Shipment option is used, you can also edit the quantity of items in those shipments with box content on OR off. Note: The proposed shipment destinations are subject to expiration after 48 hours in which Amazon will re-evaluate the destinations. There is a countdown to when the plans expire on this page, so be sure to either create, decline, or add the shipment to an existing shipment before the time runs out. If you click 'Yes, Create', then the shipment will be created and will appear in your Working Shipments. To decline a shipment, choose the Decline button. This means that this shipment will not be transferred to your Shipping Queue in Seller Central. If you want to create a shipment from these items in the future, you can create a new batch from the closed batch choosing only the items that you need to send in. If you select to decline, you'll be able to change your mind and choose either of the other options to create or combine the shipment with another up until you move on in the workflow. Note: If you choose to list your items at a later date, a Sub MSKU may have already been created for the unsent item(s) in your Inventory > FBA once the feeds have completed and your inventory next syncs from Amazon (every 4-6 hours). To ensure proper FIFO accounting occurs, please delete this Sub MSKU before relisting. Instead of creating or declining a shipment, you can choose to Add to Working Shipment, which will give allow you to add items in the shipment to an existing shipment. For information on doing this, check out the article: Proposed FBA Shipments: Add to Working Shipment – Private Workflow. Change the number of items in the shipment, up or down, then click on tab or enter. You will then see a pop up confirming your choice, and any changes you make will be reflected in Stratify as well as Seller Central. 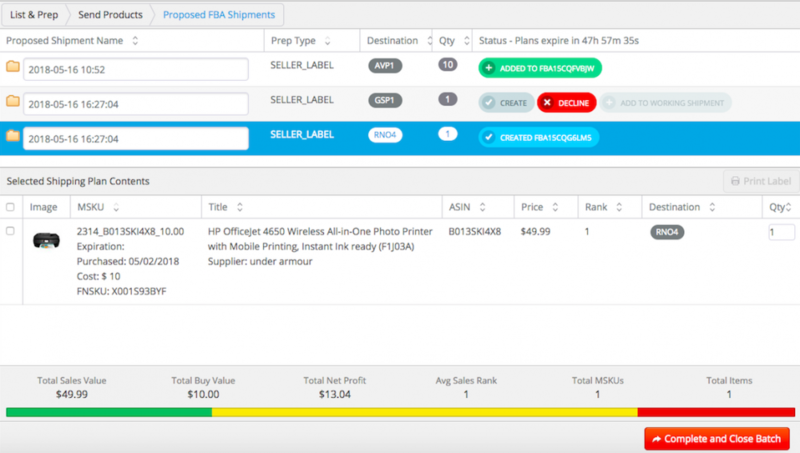 If you enter zero for the quantity, you will delete the item from the shipment displayed in Stratify and also in Seller Central. Keep in mind, you still have to abide by the 5% or 6 item rule from Amazon that limits how much you can change quantity (you will see a pop up warning you of this if you attempt changes outside those limits). Once you make all of your selections, if Box Contents is OFF, click on the Complete Batch button to finish the batch. If Box Contents is ON, click Enter Box Contents to move on to assign box contents.